Youth Vs. Apocalypse is 350 Bay Area’s youth-led program. They are a diverse group of young climate justice activists, working together to lift the voices of youth, in particular youth of color, and fight for a livable climate and an equitable, sustainable, and just world. Youth leaders are supported with networks, training, logistical assistance, and intersectional analysis in order to allow them to fight powerfully for themselves, their communities, and the planet. This group of youth leaders meets on a regular basis to discuss how to use their voices to create effective change. After a video of youth activists from YVA and other groups pushing Senator Dianne Feinstein to support the Green New Deal went viral, YVA students jumped on the opportunity to get their message out. 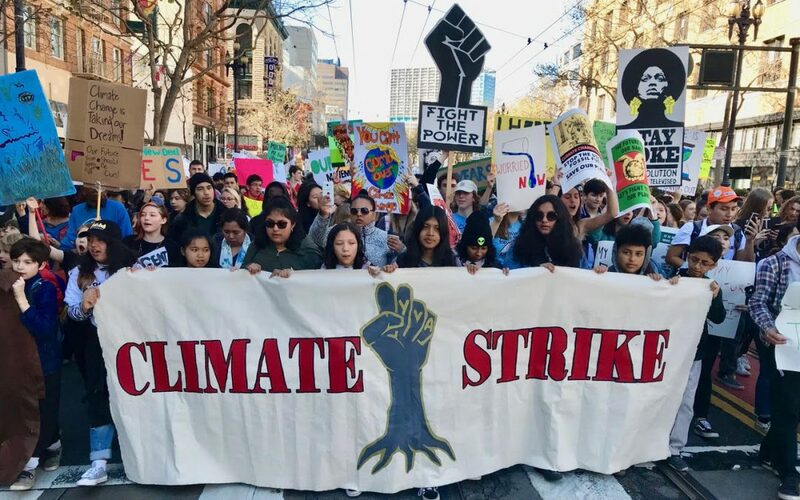 They organized press conferences, gave interviews, wrote Op Eds, developed a website, created a crowd-funding campaign and took leadership in organizing a youth Climate Strike, march, and rally in San Francisco as part of the international youth Climate Strike on March 15th; which was attended by 2000 youths. Our youth coordinator, Carolyn Norr, offers support to these youth leaders from around the Bay Area in monthly meetings, and regularly meets with five climate justice clubs in Oakland middle and high schools. Working to build support for the Green New Deal for environmental justice and investments in clean-energy jobs and infrastructure, to transform not just the energy sector, but the entire economy so we can stabilize our climate. Youth advocacy at the Air District about its role in protecting our air in The Bay from the dangers of particulate matter, toxic air pollution, and threat of more tar sands crude oil coming to the Bay Area. 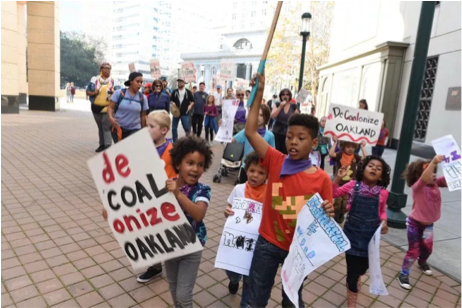 Stop Coal from coming to Oakland by working with a coalition of youth leadership groups to plan actions in a campaign to protect Oakland from coal coming via rail to the port, bringing with it harmful coal dust. Click on the link below to see the website that Youth vs Apocalypse leaders are creating. So much more coming from this growing group of youth climate activists in the SF Bay Area. Please help us help them by donating to 350 Bay Area.